In a saucepan, heat the oil and sauté the minced garlic briefly. Add the vegetable broth, ginger and pumpkin pie spice and bring to a rapid boil. Add the polenta and stir quickly. Reduce the heat and cook for about 30-40 minutes (according to package instructions). Stir constantly to avoid lumps. 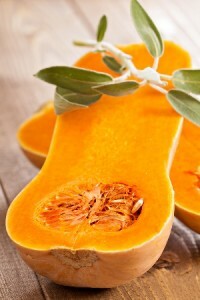 Add the pureed squash and the cream cheese cubes halfway through the cooking time and stir. Then add the Parmesan cheese and season with salt and pepper. Enjoy with a tossed salad! Serves 4.